Sunday Post. Happy New Year!!! Since this is the first Sunday Post of the year, I'd like to take a moment to wish everyone (again) a HAPPY NEW YEAR! Have a great bookish year! May all your wishes come true. May you reach all of your goals. 🌻I was able to read fifty pages per day as I promised myself I would. 🌻This hasn't happened yet because I'm lazy and I haven't written my sign-up post yet, but I'm joining Bout of Books 21. If you're joining - or have already joined - let me know. LET'S DO IT! After a long absence, I joined Top Ten Tuesday, talking about some of the 2018 releases that I can't wait to get my hands on. I confess it was difficult to narrow the list down to ten. How can I only choose ten books?! Btw, which 2018 releases are you mos excited for? Said to goodbye to 2017 and welcomed 2018. I'm hoping 2018 ends up being a good year. It doesn't have to be an excellent year (I never had one of those). I'm only hoping for nothing bad to happen and to reach some of my goals. This week I shared my most personal post to date. I discussed social anxiety and how bloggers also struggle with it. I opened my heart and shared my own experience, hoping to raise some awareness concerning the issue. Who has already survived a week without spending money on books? 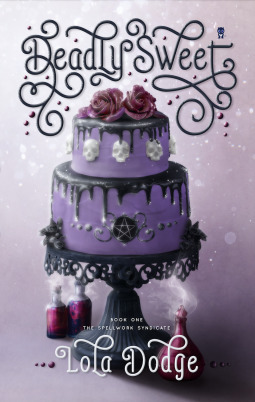 *happy dance* This week I received from Netgalley Deadly Sweet by Lola Dodge. I wanted to request this book for a long time, but since my feedback ratio is under 80%, I thought I had no chances. But this week I decided to try my luck and my request was approved. YAY! How has the first week of 2018 treated you? I...did not manage to avoid spending money on books this week 😂 Congrats on hitting 50 pages per day, that's awesome! Ahaha, I probably won't resist much longer. =P Thank you. Congrats on meeting your 50 pages per day goal! Enjoy Deadly Sweet, it sounds like it is going to be a good one. Happy reading. Happy New Year! I hope you have a great week! I love Instagram, but I cannot keep up with all the social media platforms, and I take terrible pictures, but I am loving all the cats on your feed. Hmm, not spending money on books? How is that done? I wish I could keep up with Instagram. I keep starting and then stopping. Plus, I think it is difficult to share things on there, and a lot of times giveaways want you to share their post. Now, I tried reading The Near Witch by Victoria Schwab, but couldn't get into it. I can't decide if I should try any of her other books. But everyone loves them! Thanks for stopping by my Sunday Post on Lisa Loves Literature earlier! I don't know how not to spend money on books, but I'll try my very best not do it. =P Instagram can be difficult now because of the new algorithm. I've never read The Near Witch, but it was one of her first published novels. Maybe her writing evolved a lot since then. Maybe you should give her other books a chance. Hi there! Thanks for visiting my blog last year - I am only just now back from a few weeks hiatus and getting around to all my commenting back! I loved the Shades of Magic series! So glad you're enjoying too. I am going to pick up another Schwab series early this year. Again, thanks for stopping by my blog and happy 2018! I'm in love with Schwab's writing and the worlds she creates. I can't believe it took me so long to read her novels. Good luck with bookstagram. I'm sure you'll do great.